Jamia Masjid is the first Masjid in Hong Kong. According to the official records at Antiquities and Monuments Office the Muslim Mosque known as Lascar temple was built in 1849. 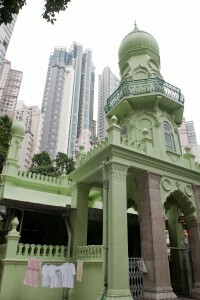 This is the first mosque in Hong Kong. The Mosque is of rectangular shape with an arched main entrance and arched windows of Arabic style on all sides. Extension of the Mosque took place in 1915, and the pillar was retained. Minutes of the Executive Council Meeting held on 25 October 1844 contains the earliest record regarding Jamia Mosque. Some of the few Muslim firms from the Indian Subcontinent who established their businesses in Hong Kong in 1841, applied to the Government for building a mosque in Hong Kong to fulfil the religious needs of the Muslims who were growing in number. An indenture note issued by the Supreme Court of Hong Kong on 23rd September, 1850 states that the Jamia Mosque land was officially registered in 1850 and the Incorporated Trustees of the Islamic Community Fund also formed in 1850 became its management organization. All other records pertaining to the Mosque were destroyed during the Japanese occupation of Hong Kong during World War II (1939-1945). However, it is a fact that Muslim troops of the Indian Army, forming a large portion of Hong Kong’s garrison, arrived in Hong Kong in 1842. Some Muslim businessmen from India, Shanghai and other areas arrived soon afterwards. The treaty for the 46,860 sq. ft. plot of land was granted on December 23, 1850. The lease is for a period of 999 years effective December 3, 1849, the date of the Treaty states the land was occupied and the first Mosque must have been constructed upon it soon afterwards. This Mosque was demolished in 1915 and the foundation stone of the present Mosque was laid on 3rd Shawwaal 1333 Hijri (Augast 15, 1915) by Nakoda Suliman Curim Mohamed. The entire cost of the new Mosque was paid by Haji Mohamed Essack Elias of the Memon Community, Bombay, India. Its Architect was Mr. A. Abdool Rahim. The Mosque is approximately 70 ft. long, 40 ft. wide and 20 ft. high. It has a portico with a minaret above. Despite its age, the Mosque is structurally stable and more than 400 people can offer their prayer inside the hall. 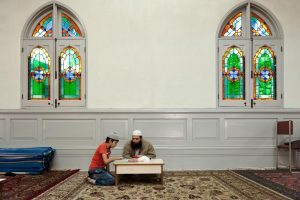 Jamia Mosque was awarded the status of Grade 1 in the list of Hong Kong’s historical buildings by the Government of Hong Kong SAR in May 2010. Major repair and renovation works have been carried out by the Board of Trustees with generous financial assistance from the Hong Kong Government’s Development Bureau in 2011-12 and 2012-13. Five times prayers are held at the Mosque and there is a large congregation on Fridays and Eidain. During the month of Ramadan Travih prayers are held and Iftar is also served.